I attach the first news of the year 2018 which is about a very special day we held with the secondary students. It was a very fitting to our ten years seeing our students growing up into young people with ideas and ambition – it was a great pleasure if not a little emotional. My sincere thanks to all of you, we cannot do this without your support. There are so many students being supported by us that our place is simply not big enough to gather all together on the same day nowadays. 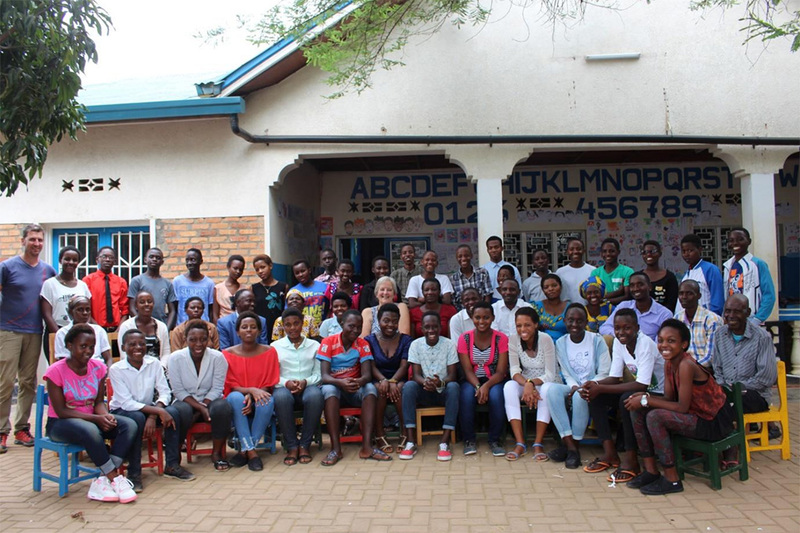 This year a very good friend of the project gave me some money before I set off to Rwanda ‘for something special’ I decided that something was going to be a meal provided by caterers and we would have a special lunch for all our secondary students. We laid out the tables on the terrace, hoping it would not rain and invited them to come for mid-day on Sunday December 10th. They had not all met up together this year. Some obviously live near each other so meet when they come home during the holidays, for others it was a good chance to catch up and exchange news. In 2017 have students in classes from Senior 1 to Senior 4 – there are six years of secondary school. Our lovely lunch was provided by Food and Stuff, there was plenty for everyone and it was delicious. We enjoyed our meal and a few words were shared. I spoke to the students about my hopes for them for the future, that we had already come a long way together and we all have hopes for what they can do with the skills and knowledge they are acquiring. I was interested to know more about how our project has impacted on lives so far. This day gave a chance for the older students to share and discuss it a little. I asked them to write down some things expressing their ideas and views – How do you feel today? What did you like about being here? And finally – given that our work has given the students reason to hope and the understanding that they can work to shape their own future – what would you like to do when you finish school? I remember many years ago being told ‘now we have hope’ I did not fully appreciate then what that meant but I see it only too clearly now. Not we not only hope but achievable ambition. In the afternoon we sat together and shared news of different experiences. We heard how two students were chosen to be ambassadors for their school at a Summer Camp and I was presented with a framed photograph as a gift for the gallery. We were happy that our good friend Vincent joined us along with his friend Dani and some staff members. 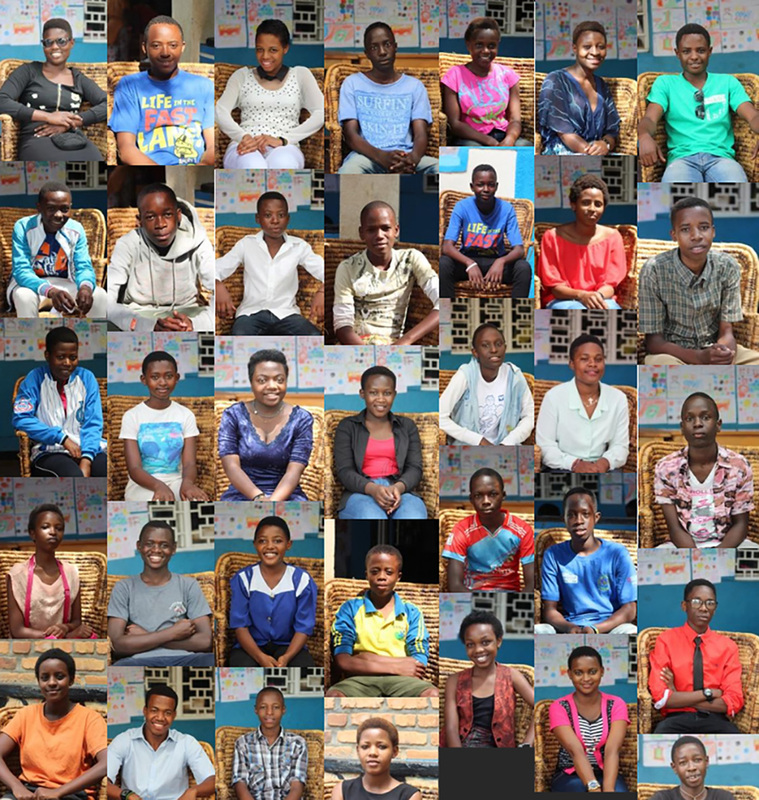 We took the opportunity to take group photographs of each year group, growing in size from the first few we sent out to secondary school seemingly so long ago. What a lovely day we had together, I am so proud of the young people our students have become. I can only hope that sometime in the future, when they are settled and independent, they will remember their years with us and want to help others in their turn. I extend grateful thanks to you all who support us in so many vital and different ways – we are going nowhere without you. And all together, staff and students. And so this party completed the celebrations at the end of our first ten years. We have come a very long way in that time. Who knows what we will reporting during the next decade with your support and the determination and achievements of our growing community – bring it on! Wishing you love, peace, good health and happiness in your lives and with huge and grateful thanks for your generous support for us.